It has to reduce friction and be highly effective. We continue to test and compare our original formula against everything from bar soaps -to- greases -to- waxes and other wood screw lubricants. Our Premium Screw Wax TM formula continues to outperform. It’s so effective, we typically recommend coating just the first four threads of the screw or fastener. A little goes a long way. Using soap as a lubricant can be corrosive since soap absorbs water. Beeswax & carnauba wax repels water. It’s based on a century old formula. Natural beeswax is an amazing product with roughly 300 chemical components. Some beeswax samples, thousands of years old, will still contain almost identical properties as fresh beeswax. That’s why experienced woodworkers and craftsman having been using it for hundreds of years and why it’s the main ingredient in Screw Wax TM. We also add carnauba wax, commonly used in mold releases and polishes, and a proprietary liquid wax blend. Our 100% natural wax formulation is truly unique and contains no petroleum products. 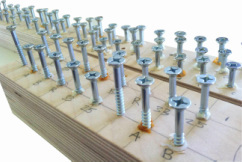 Just insert your screw or fastener tip into Screw Wax TM four threads deep, and then screw into wood. It’s soft, sticky and non-flaking. Any wax ‘peel’ that is leftover can be easily discarded or saved and re-used. Grease-based lubricants tend to smear after use, may stain the wood and can be messy. Screw Wax TM will stay soft and not discolor for years, unlike some wood screw lubricants. It's made with the highest quality ingredients. Quality does matter and that’s why we only use premium grade waxes to guarantee purity and consistency. We use a more expensive filtered white beeswax and a high purity T1 cosmetic and food grade carnauba wax in our formulation. These premium waxes give Screw Wax TM its light blond coloring. It supports farmers, is earth friendly & made in the USA! With every purchase of Screw Wax TM, you support farmers and manufacturers here in the USA. Our beeswax, tins, POP display boxes, paper ScrewTubes TM and labels are all made here in the US. The tins and paper ScrewTubes TM are easily recyclable and our servers are powered by 100% wind energy. In 2007, we began looking for a quality beeswax-based wood screw lubricant to help our customers install high-end wall rack displays. We tried the wood screw lubricants that were already on the market but we were not impressed. We felt that we could develop a better wood screw lubricant. So, we began researching the formulas used by finish carpenters, cabinet makers and furniture makers over the years. We developed and tested countless formulas and many of them were petroleum based. It became clear to us during testing that we could make a superior wood screw lubricant that is all natural and earth friendly. With our new formula in hand, we had experienced woodworkers and fine craftsman give it a shot. They came to the same conclusion we did; Screw Wax™ is the superior wood screw lubricant! We began packaging Screw Wax™ in 2008.